These are the upcoming expected dividend pay dates and amount(s) expected from each stock. UPDATE: 6/18/15 – WMC announced their dividend amount payable in July will be decreased 4.5% from $0.67 to $0.64 per share. This is the 2nd quarter in a row that WMC has decreased their dividend. I sold it all on 6/19/15 & bought NRZ. UPDATE: 7/10/15 – ORC announced their dividend amount payable in July will be decreased 22.2% from $0.18 to $0.14 per share. UPDATE: 7/23/15 – SWK announced their dividend amount payable in September will be increased 5.8% from $0.52 to $0.55 per share. UPDATE: 8/12/15 – LEG announced their dividend amount payable in October will be increased 3.2% from $0.31 to $0.32 per share. UPDATE: 9/1/15 – PGH (PGF.CA) announced a change in their dividend policy (from C$0.02/month to C$0.01/quarter after 9/15 dividend). UPDATE: 9/1/15 – PGH (PGF.CA) announced their Dividend Re-Investment Plan (DRIP) and Optional Cash Purchase (OCP) plans were being suspended, effective with the monthly dividend payable on September 15, 2015. UPDATE: 9/8/15 – CYS announced their dividend amount payable in July will be decreased another 7.1% from $0.28 to $0.26 per share. UPDATE: 9/9/15 – O announced their 82nd dividend increase payable in October will be increased 0.26% from $0.19 to $0.1905 per share. UPDATE: 9/17/15 – AI announced their dividend amount payable in October will be decreased 28.57% from $0.875 to $0.625 per share. UPDATE: 9/18/15 – NYMT announced their dividend amount payable in October will be decreased 11.11% from $0.27 to $0.24 per share. UPDATE: 9/22/15 – NRZ announced their dividend amount payable in October will be increased 2.22% from $0.45 to $0.46 per share. UPDATE: 9/24/15 – LMT announced their dividend amount payable in October will be increased 9.99% from $1.50 to $1.65 per share. UPDATE: 11/2/15 – LOAN announced their dividend amount payable in January will be increased 6.25% from $0.08 to $0.085 per share. UPDATE: 11/19/15 – PGH (PGF.CA) announced their dividend amount payable in December will be decreased 83.33% from C$0.02/month to C$0.01/quarter. Amounts shown above are total projected expected dividends, and are believed fairly accurate. Based on dividends declared, I have projected an expected total of $570.55 in June, $188.74 in July, $0.00 in August, $0.00 in September, $0.00 in October, $0.00 in November, and $0.00 in December, so far. 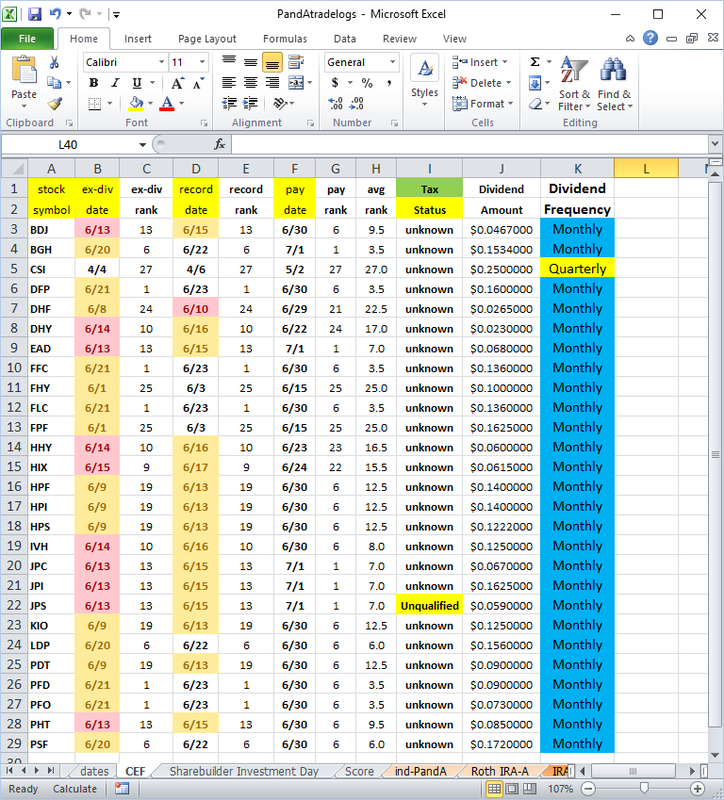 Note: For April; At the beginning of the month I will divide the previous 3 month’s dividends by 3 to get a monthly average, then multiply the result by 12. At the end of the month I will divide the current YTD dividends by 4 to get a monthly average, then multiply the result by 12. 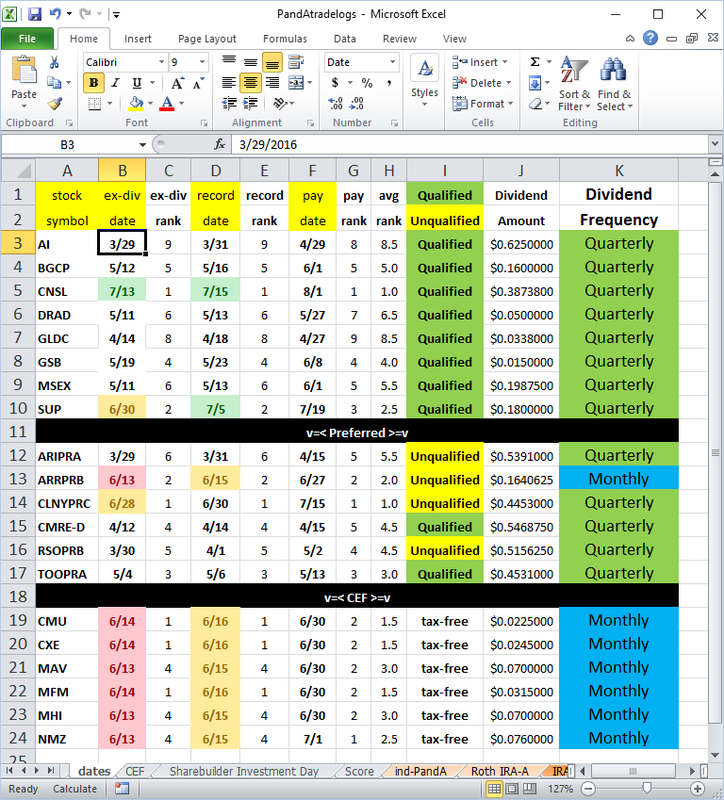 Note: For July; At the beginning of the month I will divide the previous 6 month’s dividends by 6 to get a monthly average, then multiply the result by 12. At the end of the month I will divide the current YTD dividends by 7 to get a monthly average, then multiply the result by 12. Note: For October; At the beginning of the month I will divide the previous 9 month’s dividends by 9 to get a monthly average, then multiply the result by 12. At the end of the month I will divide the current YTD dividends by 10 to get a monthly average, then multiply the result by 12. Note: For December; At the beginning of the month I will divide the previous 11 month’s dividends by 11 to get a monthly average, then multiply the result by 12. Throughout the month I will divide the current YTD dividends by 12 each week to get a ~monthly average, then multiply the result by 12. NOTE: AI reclassified all 2014 & 2015 dividends as a return of capital. Dividend paying issues that I hold pay mostly monthly dividends. Some pay quarterly. What this means is that while some issues provide a steady monthly income for each of the 12 months in a year, some only pay 4 times each year. This should result in roughly 2 months of ‘slightly lower’ dividend payments, followed by one month of ‘substantially higher’ dividend payments, repeated four times each year. That’s in theory, only. Also, in theory, the ‘big month’ payments are usually January, April, July, and October (JAJO). In reality; ARRPRB, BDJ, BGH, CMU, CXE, DFP, DHF, DHY, EAD, FFC, FHY, FLC, FPF, HHY, HIX, HPF, HPI, HPS, IVH, JPC, JPI, JPS, KIO, LDP, MAV, MFM, MHI, NMZ, PDT, PFD, PFO, PHT, & PSF pay every month. AI, ARIPRA, CLNYPRC, GLDC, and RSOPRB (only July and October) pay in January, April, July, and October. CNSL, DRAD, GLDC (only August), GSB, RSOPRB (only February and May), and TOOPRA pay in February, May, August, and November. BGCP & MSEX pay in March, June, September, and December. Data is based on TTM dividend payment dates, and will probably change in the future. Confusing? You betcha! But, that’s what makes it fun, right?